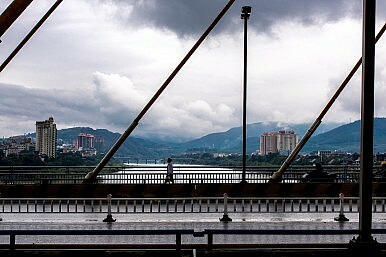 A woman crosses a bridge spanning the Lancang (Mekong) in Xishuangbanna, Yunan, China. Image Credit: Photo by Luc Forsyth. 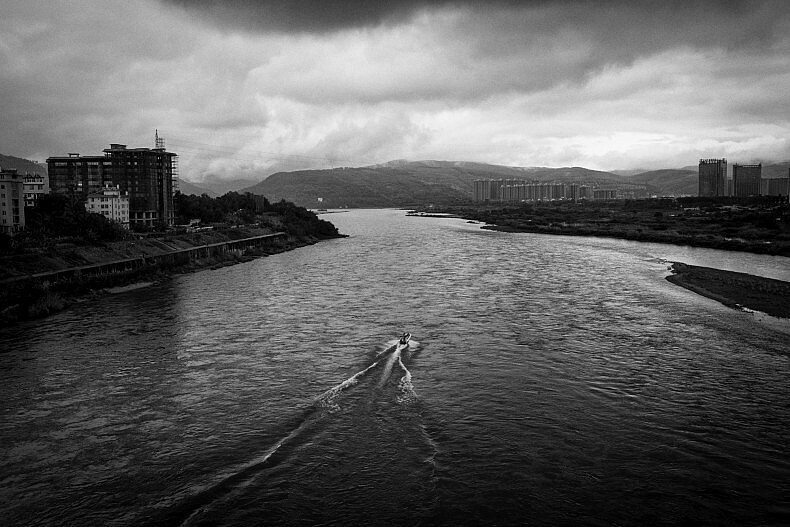 In Jinghong, the gateway to southwestern China, the Mekong ends and the Lancang river begins. After nearly a year of travel through Southeast Asia, we entered the final country of our journey. Yet as we explore the regional capital of Xishuangbanna prefecture, we are acutely aware that there’s still more than 2000 km to go before reaching the Mekong’s source high on the Tibetan plateau. A tourist boat makes its way along the Lancang (Mekong) river in Xishuangbanna, Yunnan, China. Photo by Gareth Bright. 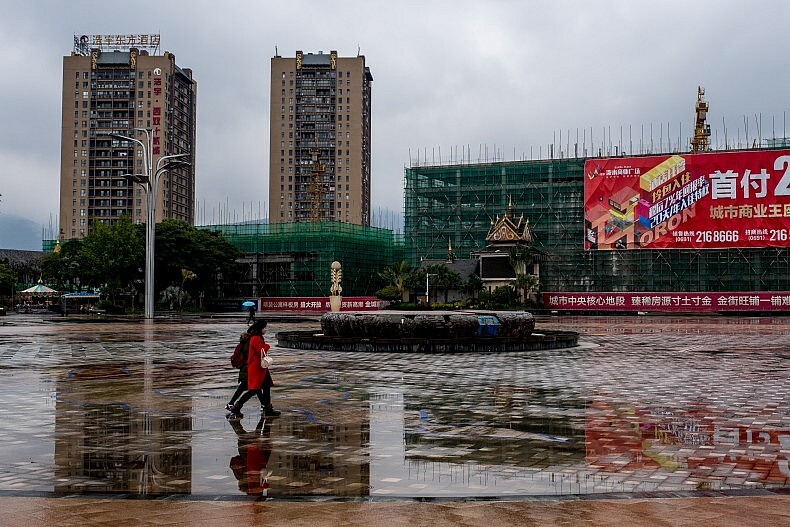 A cold grey drizzle greeted us as we stepped off the plane at Jinghong international airport, the capital city of the Xishuangbanna autonomous prefecture and the gateway to southwestern China. Despite a temperature of around 15 degrees Celsius (59 F), after months of tracing the Mekong river through the tropical heat of Southeast Asia, the chill bit through to our bones and we scrambled to pull jackets and scarves out of our luggage. Downtown Xishuangbanna, Yunan, China. Photo by Luc Forsyth. Our Mandarin speaking friend and travel companion, Yan, was waiting in the arrival hall. Possessing undergraduate and masters degrees in journalism, she was also a skilled photographer and her spoken English rivaled our own. We were in good hands. 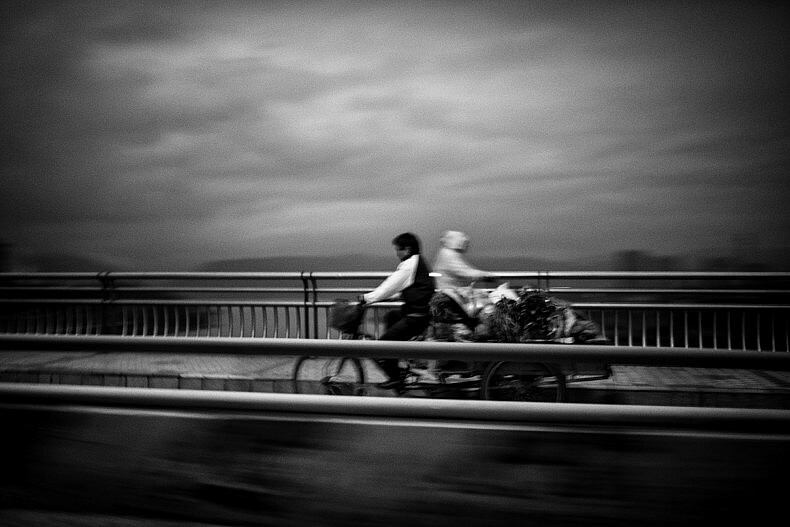 Two locals cross each, early morning, on a bridge spanning the Lancang (Mekong) in Xishuangbanna, Yunnan, China. Photo by Gareth Bright. When we got our first glimpse of the river in Jinghong, it took a moment to process the fact that we were no longer looking at the Mekong. 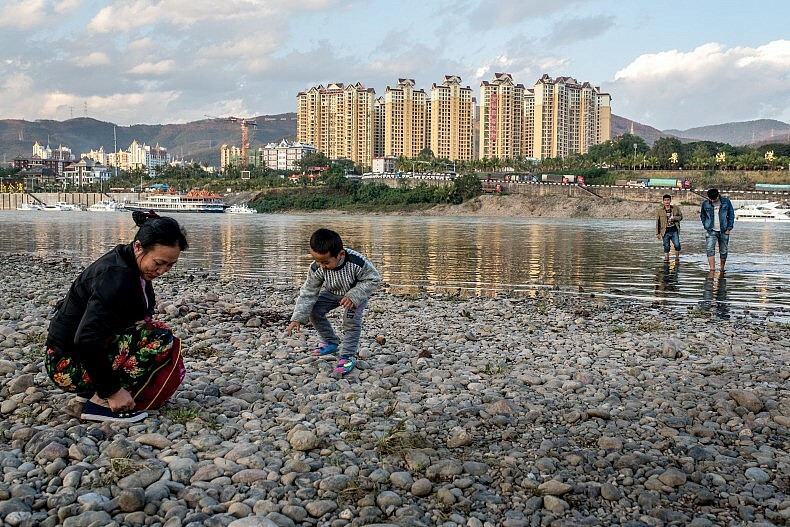 The Lancang river, as it is called in China, was physically the same body of water we had been following for nearly a year, but the change in name signaled that we had entered into a different (and the final) phase of the journey. 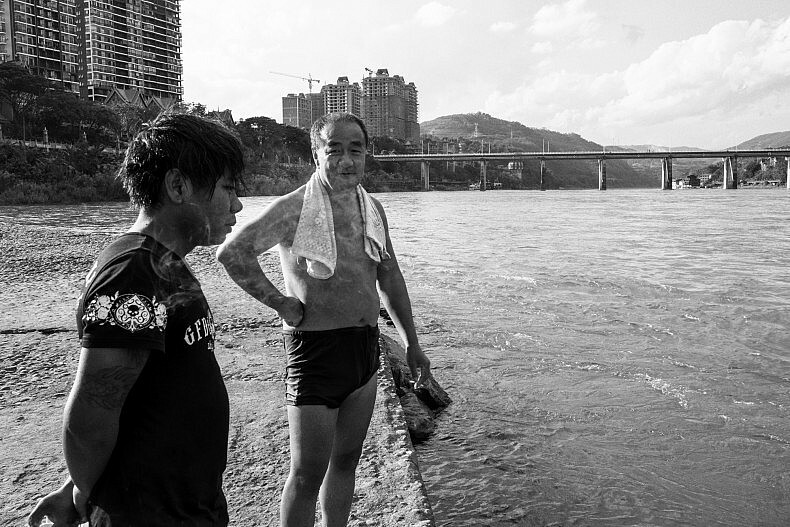 As we would learn over the course of our time in China, in many important ways this was a very different river to the sluggish waterway we had come to know so well. Tourists and locals gather along the Lancang (Mekong) river in Xishuangbanna, China.Photo by Luc Forsyth. 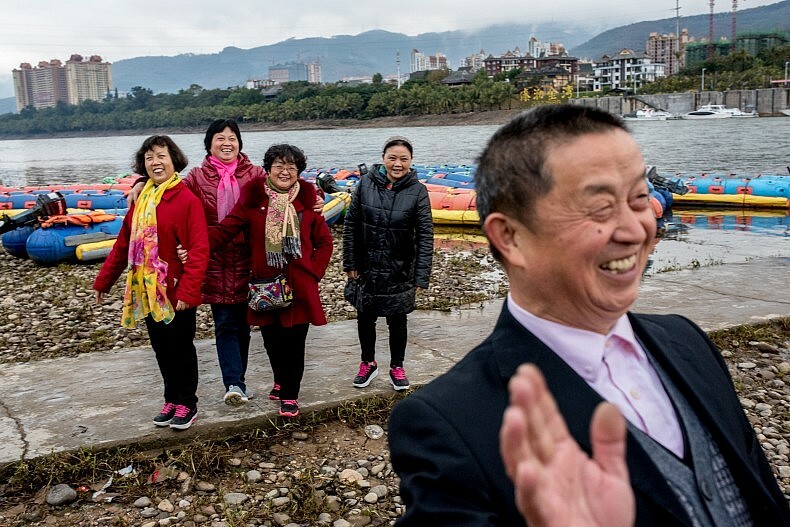 Tourists pose for pictures on the Lancang (Mekong) river in Xishuangbanna, Yunnan, China. Photo by Gareth Bright. The swarms of water taxis that plied the floating markets in Vietnam were absent, and the omnipresent wooden fishing boats that dotted the river throughout Cambodia and Laos were nowhere to be seen. Even the water’s color had changed perceptibly from the murky brown of the lower Mekong basin to a more pronounced blue that flowed with surprising speed. 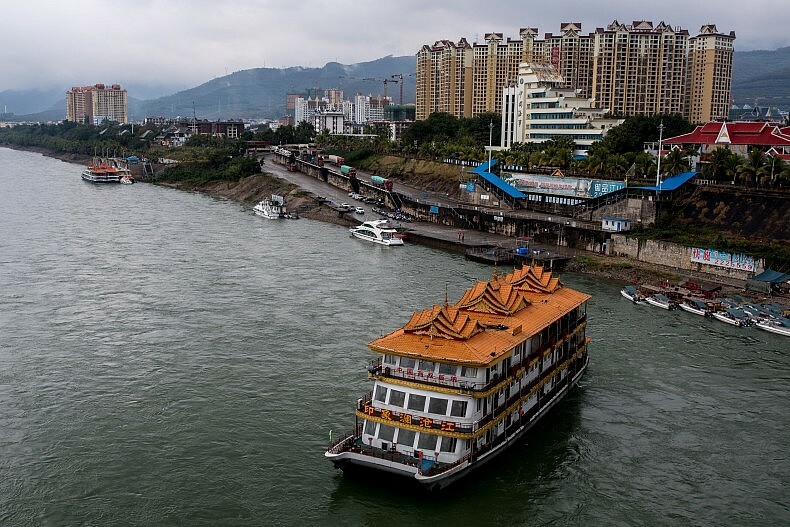 A floating restaurant and leisure ship floats down the Lancang (Mekong) in Xishuangbanna, Yunnan, China. Photo by Luc Forsyth. 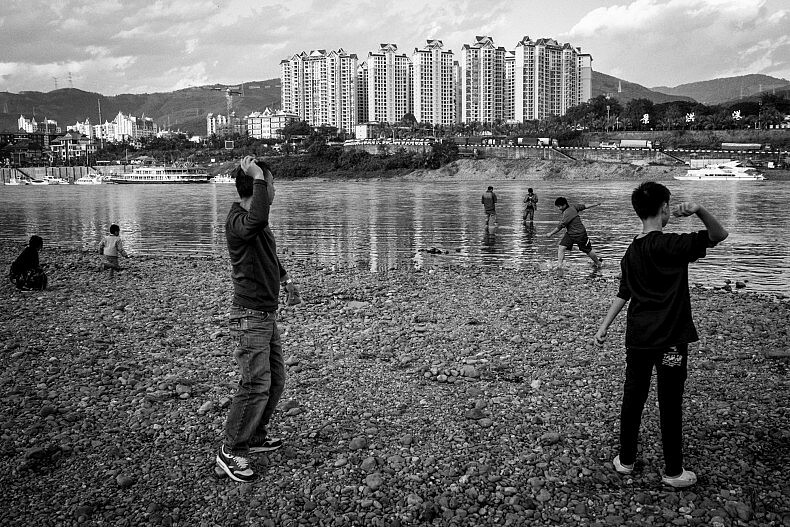 Tourists and locals gather to skips stones and play along the Lancang (Mekong) river in Xishuangbanna, Yunan, China. Photo by Gareth Bright. 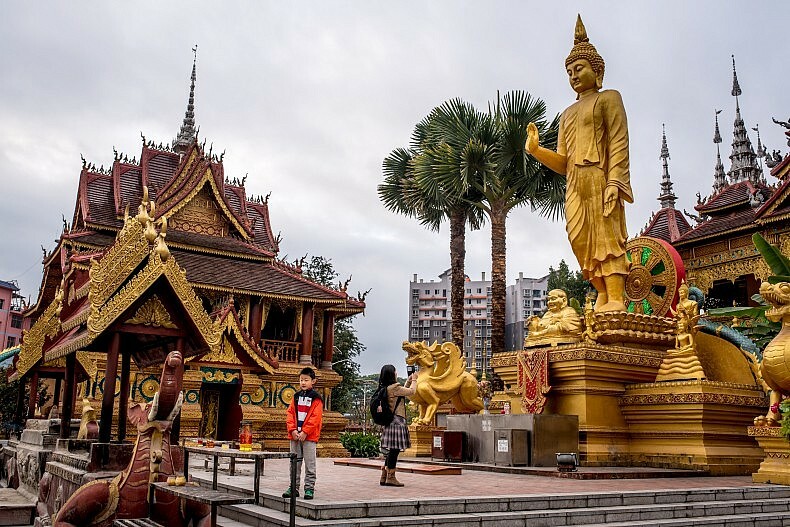 Xishuangbanna, China–with sites like this large Buddhist temple–is a popular desitnation for Chinese vacationers, but there were few foreign tourists. Photo by Luc Forsyth. 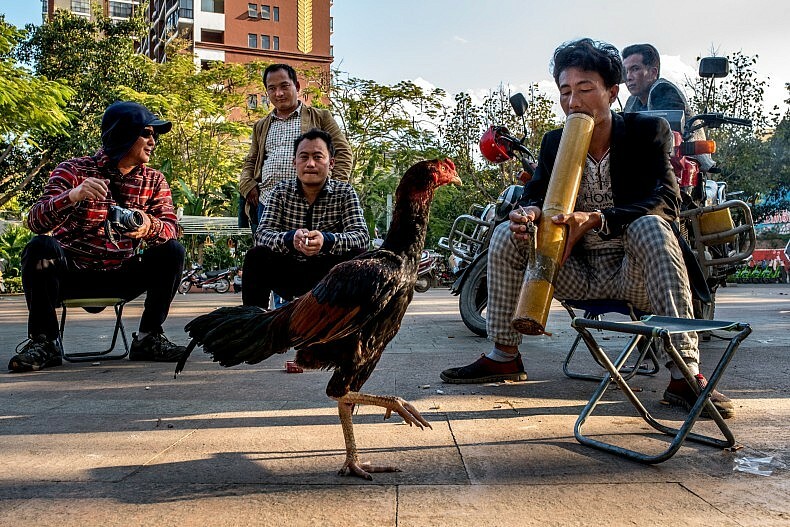 Men gather to smoke tobacco and look at singing birds in a public park in Xishuangbanna, China. Photo by Gareth Bright. 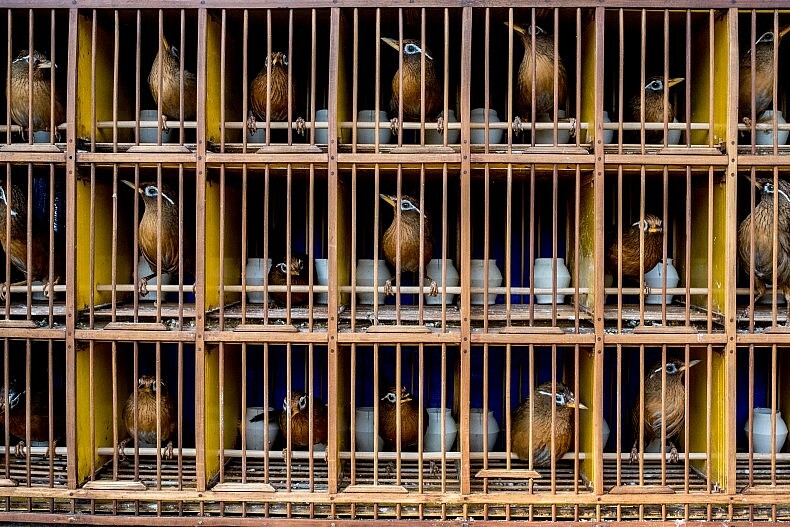 Caged songbirds in a public park in Xishuangbanna, China. Photo by Luc Forsyth. It wasn’t long before we started to attract considerable attention. Though Xishuangbanna was a popular destination for Chinese tourists, we hadn’t yet seen another foreign visitor, and the locals seemed excited to chat. Before we knew what was happening we were drawn into a group of men who asked us standard questions–where did we come from? How did we like China?–before thrusting large bamboo water pipes into our hands. 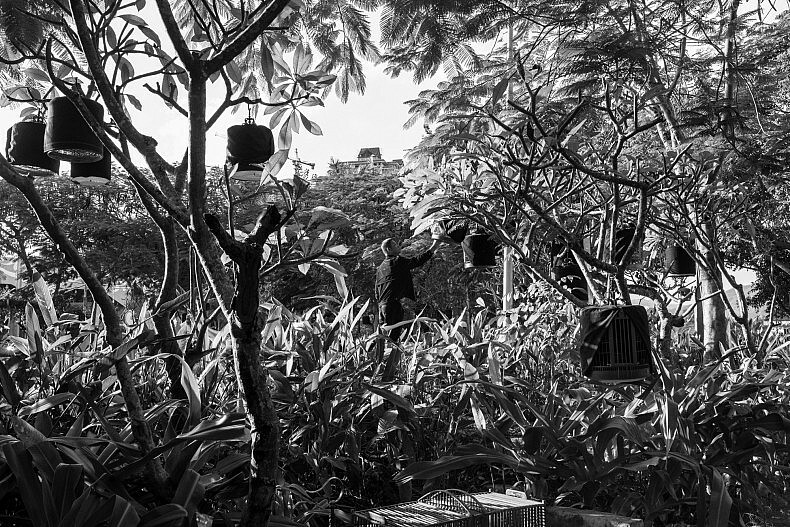 A man smokes tobacco from a water pipe in a public park in Xishuangbanna, China. Photo by Gareth Bright. A cigarette was wedged into a small spout at the base of the pipe, and with much effort and a massive amount of lung power we were encouraged to haul repeatedly on the tube until we were coughing out great clouds of smoke. Though not unbearable, the experience was by no means pleasant, and made all the more difficult by the fact that our unshaven faces made it impossible to form a tight seal around the mouth of the pipe. After we each finished an entire cigarette in this fashion, lightheaded and dizzy, the men immediately tried to restart the process. Only by distracting them with our cameras did we manage to escape additional rounds. 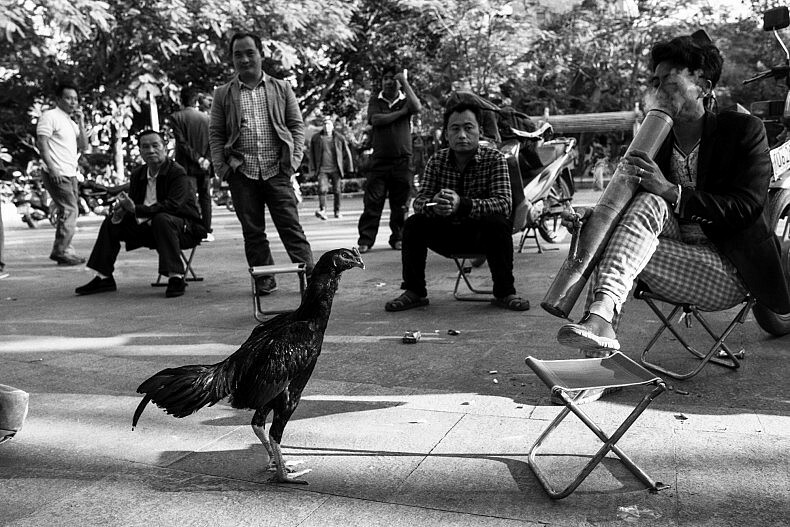 Men gather in a public park in Xishuangbanna, China. Photo Luc Forsyth. 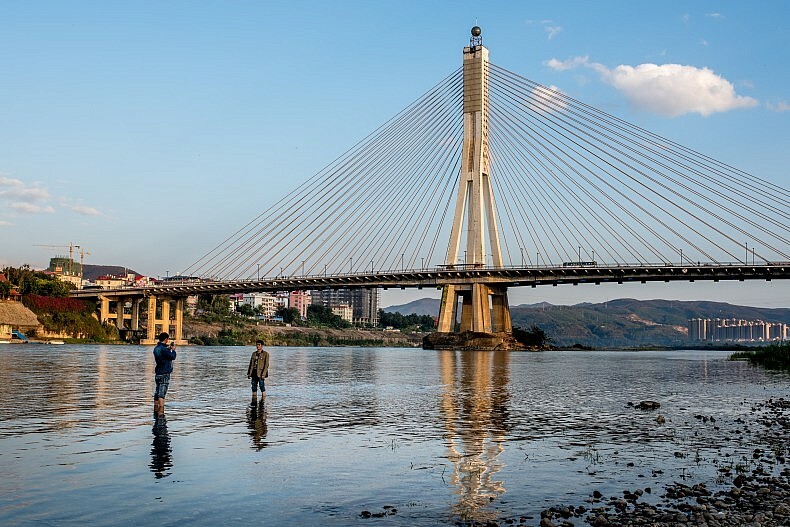 Two locals stand on a jetty that extends into the river, after swimming in the Lancang (Mekong) river in Xishuangbanna, China. Photo by Gareth Bright. Tourists pose for pictures along the Lancang (Mekong) river in Xishuangbanna, Yunan, China. Photo by Luc Forsyth. Groups of tourists gather for pictures along the Lancang (Mekong) river in Xishuangbanna, Yunnan, China. Photo by Gareth Bright. 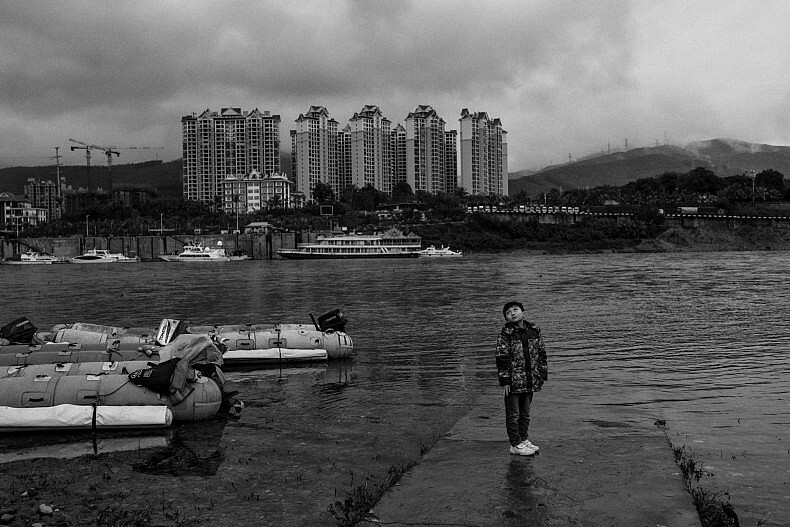 Whether it is called the Lancang or the Mekong, the river brings people to its banks. Photo by Luc Forsyth. 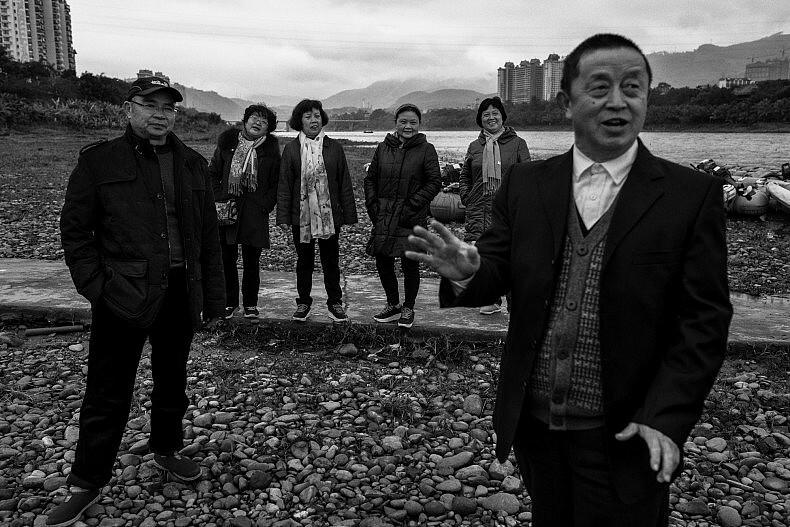 In northern Yunnan, the future of multiple rural villages are under threat from hydropower dams along the Lancang.